Can Window Shutters fit on Patio Doors? 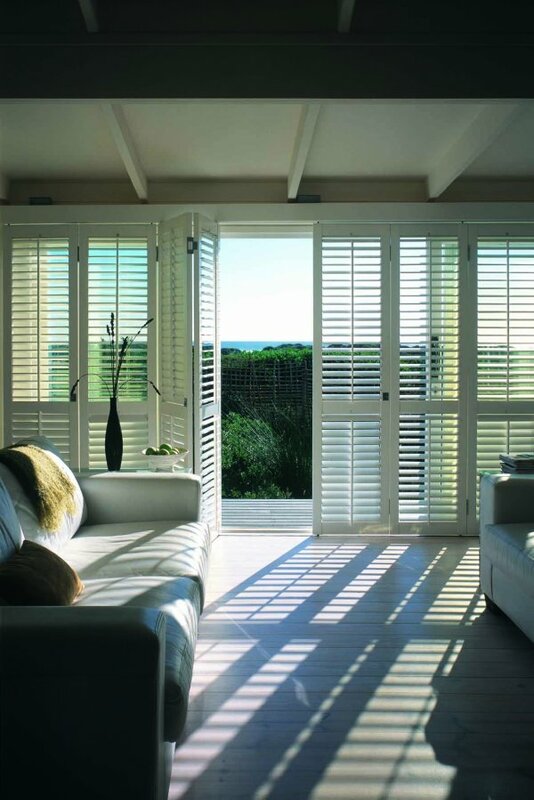 The simple answer is yes, plantation shutters or window shutters can be fitted to patio doors and to great effect. There are many types of patio door, including single, double, sliding, bi-folding, opening outwards and opening inwards, but whatever the style, we have a shutter system to suit. For single doors there is an option to have the shutters fitted directly to the door itself. Fixing the shutters directly to the door will mean the shutters and the door work as one unit (open the door and the shutters open with it). The shutter panel is hinged within its own framework meaning the shutter can still be opened allowing access to clean the glass. French doors, like patio doors can also be fitted with plantation shutters. Depending upon the width of the opening, there are 2 different methods of installing shutters at these types of doors. We have a tracked shutter system enabling us to span essentially limitless distances and we have the more traditional method of fitting using frames and hinges. There are two different types of tracked shutter system: the bi-pass system and the bi-fold system. The stand-out benefit of a tracked shutter system is the spans that can be covered by using it. The weight of the shutters is supported through the track which is ordinarily fixed to the head of the reveal. Supporting the weight of the shutter panels through the track takes the weight and stress off the hinges meaning we can literally use a limitless amount of shutter panels to span any distance. This is in contrast to a maximum of 4 shutters panels from one side or 8 in total when fitting shutters from a frame and hinge. Due to the varying styles in patio doors, their sizes, configurations, how they have been installed and operate, we do not offer a one size fits all solution. All of our plantation shutters are custom made not just for size but also for function and usability and as such all our interior shutter systems will be totally bespoke, offering a unique shade solution for your patio or french door. How Does the Tracked Shutter System Work? The preferred method of installing shutters when using the tracked system is within the recess of the opening. The shutters panels will bi-fold and slide in the track either to one side or both sides and will lie flat against the recess. This will give clear, unrestricted access to the patio doors without compromising on the look of the shutters or how they are designed. Nearly all our shutters will fit on patio doors but there are some limitations that may dictate the style you choose, it is therefore important to get advice from your local Signature Shade advisor. We would suggest a free home survey for patio door shutters is essential. In determining the right type of installation, we will listen to your needs and establish how you use the doors on a daily basis. Everything is taken into account ensuring we design the perfect system for you and that the shutters give trouble free performance for years to come. For added peace of mind we include a free, 3 year warranty on all our plantation shutters. We believe our patio door shutters to be the best available in the UK. Interior Shutters The Number 1 Choice of Window Treatment.